Heat oven to 425°F. On lightly floured work surface, unroll 1 pie crust. Roll to 12-inch circle with rolling pin. With 6-inch round cutter, cut 2 rounds from crust. Reroll scraps, and cut 1 additional round. Repeat with remaining 5 pie crusts, for a total of 18 pie crust rounds. Place 9 rounds on lightly floured cookie sheets. Cover with plastic wrap; refrigerate until needed for top crusts. Fit remaining 9 rounds in bottoms and up sides of 9 ungreased tart pans, pressing firmly. With fork, prick bottoms and sides generously. Place tart pans on ungreased cookie sheets. Use small letter- or heart-shaped cutter to cut small shapes from remaining pie crust scraps; place on cookie sheets with tart pans. Prick with fork; sprinkle lightly with coarse sugar. Bake tart shells and shapes 6 to 8 minutes or just until shells are dry (only partially baked) and shapes are golden brown. Remove shapes from cookie sheet. 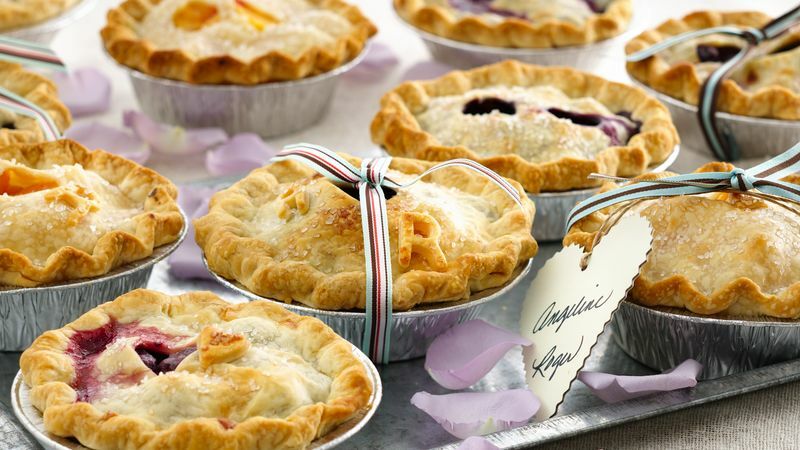 To make blueberry pies: In large bowl, mix 1/2 cup sugar and 1/4 cup flour. Stir in blueberries, ginger and 1 tablespoon lemon juice. Spoon into 3 crust-lined tart pans. Cut 1 tablespoon butter into small pieces; sprinkle evenly over blueberries. To make peach pies: In large bowl, mix 1/2 cup sugar, 1/4 cup flour and the cinnamon. Stir in peaches and 1 tablespoon lemon juice. Spoon into 3 crust-lined tart pans. Cut 1 tablespoon butter into small pieces; sprinkle evenly over peaches. To make cherry pies: In large bowl, mix 3/4 cup sugar and 1/3 cup flour. Stir in cherries and almond extract. Spoon into 3 crust-lined tart pans. Cut 1 tablespoon butter into small pieces; sprinkle evenly over cherries. Remove top crusts from refrigerator. Using small letter- or heart-shaped cutter, cut 1 shape out of center of each of the 9 rounds. Cover each of the 9 pies with top crust; seal and flute. Brush tops with milk; sprinkle lightly with coarse sugar. Place cutouts on cookie sheets with pies. Sprinkle cutouts lightly with coarse sugar. Bake cutouts 6 to 9 minutes or until golden brown, pies 30 to 40 minutes or until crust is golden brown and filling begins to bubble. Cover pies with sheet of foil after 15 minutes to prevent overbrowning. Cool pies on cooling rack at least 2 hours. Garnish with cutouts. This recipe can easily be adjusted to serve more guests. If you don't have a 6-inch round cutter, use the top of a 6-inch diameter bowl as a pattern. Place the bowl upside down on the crust, and cut around the bowl using a sharp paring knife. To easily chop crystallized ginger, sprinkle 1 tablespoon sugar on cutting board. Chop ginger on top of sugar to coat sticky sides of ginger in sugar.